Guaranteed Fitment Right Parts... Everytime! Keep your Honda ALL Honda with Genuine Parts and Accessories! Browse our large inventory of Genuine Honda Parts and Accessories that are engineered and designed for your specific Honda model. Save money with our special wholesale online pricing dealer direct for our online customers! If you love your Honda and want to make it your own, you’re in the right place. 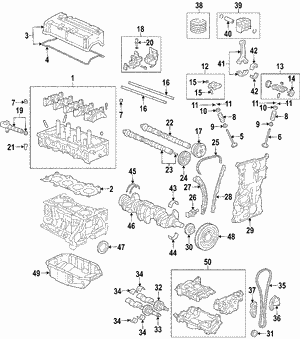 HondaPartsConnection.com connects you to a full catalog of Genuine Honda Parts and Accessories. We carry Accessories for all the Honda's and even the the newest 2019 models, plus any Genuine Honda replacement parts you may need. We can help you find that correct part to personalize your car or fix any problem! To shop for Genuine Honda Parts and Accessories, simply click on the link and choose your vehicle. After you select the year and model of your Honda, you can browse the accessories available. You also have the option of searching for accessories by VIN number. Entering the VIN number in the search bar is always the BEST way to insure proper fitment. Once you get to the list of accessories available for your car, you can use the search box to narrow your results. Rest assured, all the accessories displayed will be genuine Honda parts that fit your car perfectly. You’ll see that many of the accessories can be purchased without installation. Our Honda parts staff can also give you access to DIY installation instructions for purchased accessories.